Michelle's Tasty Creations: I've been awarded the Sunshine Award! 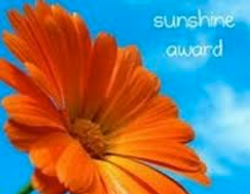 I would like to say a big thank you to Robyn, From Robyn'sView for the lovely nomination of the Sunshine Award. I am very touched that Robyn considers my blog to be one that positively and creatively inspires others in the blogosphere. I can't even begin to tell you how honored I am. Robyn, has a great blog where she shares amazing DIY recipes like, Whipped Coconut Body Butter,Coconut Sugar Scrub, Homemade Deodorizing Air Freshener , and many more. She also shares yummy recipes like her, Blueberry Crescent Rolls , Cinnamon Vanilla Fruit Parfait, and Buttery Lemon Bars. Answer 10 questions about yourself. (I added one because I've noticed that all the lists only have 9). Congratulations! I love your site. Robyn has very good taste! Awww Michelle! Thank you so much for the nomination. We feel truly honored. Can't wait to highlight you and repost on the blog :) you're the best! :) Thank you so much for passing this onto us!! You are too sweet!! Have a wonderful weekend!!! Thanks for nominating me:) How fun!! Thanks so much for the nomination and what great choices you have listed! Michelle! We gave out our sunshine awards today, and I just wanted to tell you THANKS AGAIN so much. You are so wonderful :), I hope you get tons of clicks!